Makai Ocean Engineering’s involvement with deep water cable installation dates back to 1983. Our Cable Division was formed in 1988 to apply Makai’s capabilities to challenging cable installations worldwide. Makai provided Certified MakaiLay Engineers onboard the cable vessel Asean Explorer to support the FOBN (Fiber Optic Backbone Network) Project in Philippine waters. The successful cable lay operations began in September 2002 and lasted until December 2002. During May and June of 2003 MakaiLay Engineers onboard the cable vessel Ile de Sein assisted ALDA Marine in the successful completion of a cable lay located just west of the Mediterranean Sea. Onboard the cable vessels Ile de Batz and Ile de Sein, MakaiLay Engineers assisted Alcatel in the successful completion of the Apollo transatlantic lay which spanned approximately 13,000km. The Apollo Project represents a dual cable configuration, relying on two links from the United States to United Kingdom and France respectively. Operations began June 2002 and were completed ahead of schedule before the end of the year. Makai Ocean Engineers were hired to produce slack plans during October, 2001 for the Balalink and NACS Taiwan Spurs projects. MakaiLay Engineers participated in the successful completion of a TGN cable lay (Tycom) onboard the C.S. Knight from October 2001 through January 2002. MakaiLay Engineers participated in the successful completion of a segment of the TGN-Pacific cable lay (Tycom) onboard the C.S. Baron from September 2002 through November 2002. Onboard the cable ship Pertinacia, MakaiLay Engineers supported the FARICE Project that spanned over 1400km and connected Iceland, Faroe Islands and Scotland. Operations began in June 2003 and were successfully completed in September/October 2003. Makai Engineers participated in a cable lay onboard the cable vessel Maersk Responder that took place in the Indian Ocean during October 2001. During 2000, Makai was a subcontractor to Global Marine Systems and provided onboard technical support services with our Cable Lay Monitor system during installation of the three-leg Japan Ã¢â‚¬“ USA Cable. During June through September 2001, MakaiLay Engineers were actively involved in a cable lay onboard the Oceanic Princess for the C2C cable network. From August through October 2001, MakaiLay Engineers participated in a cable lay onboard the Oceanic King for the C2C cable network. In December 2001 Makai Ocean Engineers assisted in the planning process of a portion of the C2C cable network. Engineers involved in submarine cable planning and installation used MakaiPlan Pro and MakaiLay to enhance their productivity. MakaiPlan is used to create more efficient cable planning operations. Makai participated in sea-trials in the Mediterranean onboard the vessel Nautical Tide (TideWater) in September 2003. The SIAC personnel were trained in operating the Makai system, taking advantage of the most advanced MakaiLay features for future lay activities. In 2003 Makai Ocean Engineers completed the offshore portion of a submarine cable desktop study linking the major Hawaiian Islands. During July, 2001 Makai supported Tyco repair operations onboard the SS Normand Cutter. From November 2001 through January 2002, Makai Engineers provided support for a cable lay off Portugal using MakaiLay. Operations took place onboard the SS Normand Cutter and resulted in a successful deployment. From November 2001 through February 2002 MakaiLay Engineers participated in a cable lay onboard the C.S. Tycom Reliance. MakaiLay Engineers participated in the cable operations involving Dockwise and Solstad vessels from during 2001/2002. In 1999, Makai was a subcontractor to Global Marine Systems and provided onboard technical support services during the installation of two legs of the Southern Cross project: 1) the Australia – New Zealand section – Hawaii and 2) the Hawaii – West Coast USA section. Seismic and tsunami sensors near Kamaishi. A telecommunications cable between Miyake-Jima and Hachijo-Jima. Seismic and tsunami sensors combined with a platform-mounted camera to monitor geologic activity near Muroto. In 1997, Makai was subcontracted to provide planning assistance in the installation of the Hawaii Shallow Water Training Range, HISWTR. Makai completed several cable deployment simulations along the selected cable routes to recommend appropriate values of cable bottom slack and deployment speeds along the various routes to ensure that the hydrophones will be installed within the required placement tolerance. Makai has been contracted to provide full navigation and real-time deployment control services for the deployment operation of the HISWTR in 1999. (CLS) to determine the slack control and level of placement accuracy that could be expected during the deployment of the fiber optic cable and the 51 in-line hydrophones that made up the cable system. These simulations were also useful to determine appropriate values of deployment speed in order to properly land the hydrophones on their targets even in the areas where abrupt course changes existed. In late 1997, Makai provided Navigation and Real-Time Cable Deployment Control services during the installation of the PTS off Berry Islands, in the Bahamas. The installation was very successful and a fully functional shallow water tracking range is now in service. akai provided technical support services during the installation of the Trans-Atlantic cable lays Gemini South and Gemini North onboard the vessels CS Innovator, CS Venture, and CS Agile of Cable and Wireless Marine. Makai provided simulation and on-board technical support services for the installation of the Jasuraus cable lay, a 3,000 km long lay between Australia and Indonesia in 1996. Makai is under contract with the National Defense Center of Excellence for Research in Ocean Sciences (CEROS) to develop a unique approach to the management and avoidance of loop formation during cable installations. This is an ambitious R&D project which addresses the loop formation problem in its entirety from the cable manufacture to placement of the cable on the seabed, and attempts to develop a practical methodology by which loops can be avoided. 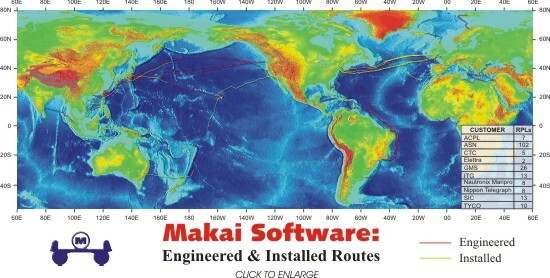 In 1995, Makai completed a series of computer simulations to model the deployment of different types of cables with heavy in-line seismic sensors in Sagami Bay, Japan. Makai also provided technical support services during the proving trials and cable deployment operation in Sagami Bay. The successful installation, in strong current and interrupted by a storm, of these challenging cables paved the way for continuation of the government program to install essential seismic sensors deep in the ocean. This project also included the sale of a Cable Lay Simulator and a three week training course. Simulations allowed NTT to optimize their cable route and deployment plan to increase cable lay accuracy and minimize deployment risks. ICS to control the cable bottom tension and cable shape during cable retrieval operations could minimize (by a factor of 4 to 5) the length of cable that would be dragged on the ocean bottom. Minimizing cable dragging on the bottom significantly reduces the chances of damaging the cable (e.g. snagging of rock outcrops) during retrieval/maintenance operations. Makai was under contract with the National Defense Center of Excellence for Research in Ocean Sciences (CEROS) to develop a real time, automated control system for deployment of small diameter cables with in-line sensors. A working and validated set of robust automation algorithms incorporated into a working control simulator system was the main product of this research. The final system developed represented a significant advance over existing systems, by providing real-time control automaton that eliminates the need for highly trained personnel, increases reliability and flexibility and decreases operational cost. This work covers the most technically challenging areas of cable deployment control and yielded a product, an automated cable lay simulator, of great future significance to the Navy and commercial industry. This work was successfully completed in early 1997. Makai completed a series of computer simulations to model different deployment conditions performed by NCEL in their Underwater Deployment Experiment. These simulations included deployment of micro cables with in-line sensors from a surface platform under low and high speeds and different values of cable slack. Makai’s results were independently evaluated, and it was determined that the cable model used by Makai’s ICS accurately simulated these deployment operations considerably faster (one to two orders of magnitude) than the more complex cable dynamic program used by the U.S. Navy (SEADYN). Makai was a subcontractor to one of the large defense contractors working on the ADS project. Makai’s responsibilities were to simulate different deployment scenarios from surface platforms for various arrays that would form part of the family of Advanced Deployable Systems (ADS) for the U.S. Navy (SPAWAR). The Makai Cable Lay Simulator was used in these simulations to determine methods to accurately deploy these arrays with acoustic sensors on the bottom, and thus avoid the need to calibrate the deployed arrays. This project involved the use of a “ship of opportunity” to lay three cables, each 210 km long, in waters ranging from 10 m to 4,200 m deep. These cables contained several in-line hydrophones which had to be placed on specific targets along a pre-established route. In 1992, the Cable Lay Simulator was used to determine: (a) the placement accuracy expected for a specific set of cable laying equipment and oceanographic conditions, and (b) the degree of cable slack control that could be achieved to minimize the total length of cable used and avoid the use of additional expensive repeaters. In 1994, the ICS was used to accurately place of the hydrophones off SW Australia. A post-deployment survey completed by the Navy determined that the final average placement error for the hydrophones was within 2% of the values predicted by previous simulations run with the Makai CLS using the same equipment that was used during the at-sea deployment operation. Despite using a “ship of opportunity” with poor seakeeping capabilities in high sea states, the use of the ICS allowed the cable layer to accurately control the placement of one of the cable systems in sea states 6-7 (sustained winds of 30 knots, 10 ft swells and 8 ft seas). During this installation, the ICS showed that it could accurately control the cable deployment at ship speeds of 6 knots in depths of water of only 60 m.
Makai was under contract to the American Samoa Power Authority (ASPA) to provide services in the planning, design and installation of a 15 kV submarine power cable between the Islands of Tutuila and Aunu’u. Makai completed a survey to select the best cable route, prepared the cable specifications, selected the cable, designed the installation of the cable and prepared a deployment plan. Makai also supervised the deployment and installation operation which was completed in 1993. From 1990 to 1993 Makai worked with the University of Hawaii in providing cable laying assistance to the Deep Underwater Muon and Neutrino Detection (DUMAND) project. This scientific program involved laying a fiber optic cable and the lowering and accurate placement of multiple vertical instrumented arrays off the Island of Hawaii in 4,800 m deep water. A total of nine arrays are to be positioned on the ocean floor within 40 m of each other and with an absolute positional accuracy of less than 10 m. Makai’s Cable Lay Simulator was used to run multiple computer simulations to define equipment needs and deployment strategies to achieve the desired accuracies and to prepare a deployment plan for the cable and strings. At the end of 1993, the Integrated Control System (ICS) was used to successfully deploy the first instrumented string and lay a 30 km long fiber optic cable from a depth of 4,800 m to shore. In 1990, after the successful completion of the HDWCP, Makai Ocean Engineering Inc. was contracted by the U.S. Navy, Naval Facilities Engineering Command (Chesapeake Division), for the installation of the Phase II of the Southern California Anti-Submarine Warfare Range (SOAR II). The SOAR II project involved the deployment of a total of eight, 40 mile long cables, each having 8 hydrophones and several repeaters. Makai provided an on-site two-week training course to Naval Facilities Engineering Command personnel who did sensitivity analysis and assisted during the successful deployment. cable engine freezings, and severe changes in currents. According to an independent survey completed by the U.S. Navy, the mean value of the hydrophone location from the target center was 46 m, half the maximum allowable error. Makai was employed by the Hawaiian Electric Company for ocean engineering assistance in surveying and developing a bid package to lay a power cable between the islands of Maui, Lanai, and Molokai. Makai defined the survey requirements and coordinated the survey efforts with Seafloor Surveys International (deep water side scan and near shore survey). Makai used our Cable Span Analyzer Program during the offshore survey to identify in real-time areas that were too rough for a power cable. By coupling the data collection process with the data analysis, we were able to effectively direct the survey and identify an acceptable path while at sea, shortening significantly the time spent at-sea. Makai played a key role in the Hawaii Deep Water Cable Program (HDWCP). The HDWCP was a research and development program co-sponsored by the U.S. Department of Energy and the State of Hawaii. The purpose of this program was to determine the technical feasibility of deploying and operating a submarine power transmission cable between the Island of Hawaii and the Island of Oahu. This project posed unique challenges never encountered by any previously laid power cable. Some of those challenges were: the cable had to be laid in depths of up to 1,920 m (6,300 ft) almost four times deeper than any site of past power cable lays, bottom slopes along the route were as high as 44 degrees, winds of 35 knots 35% of the time, 8 ft seas and surface currents of 2.9 knots. Coordinated and directed two different surveys of the Alenuihaha Channel. These involved precision measurement of bottom roughness and mapping expansive areas while searching for an adequate path. Makai analyzed the data, selected the cable path and verified that the route selected was acceptable relative to the known characteristics and limits of the power cable. Developed unique software (the Cable Span Analyzer – CSPAN) for analyzing a cable laying on a rough sea floor. This software quickly and effectively determines the length of the cable spans and the severity of the cable bends. Developed a state-of-the-art Integrated Control System (ICS) for guiding the ship and cable laying equipment to precisely lay a power cable along the specified path in 1920 m water depth. The HDWCP required accurate control of bottom tension and precise cable placement. Some portions of the path required a placement accuracy of 12 meters. Installed and operated the control system in 1989 during an at-sea cable laying test in the Alenuihaha Channel. The control system proved very successful, the average error for all portions of the approximate 20 km of cable laid was 4.7 meters, far exceeding the allowable tolerance. Provided to Program Management guidance and recommendations that were key to defining the direction, nature and scope of the program.